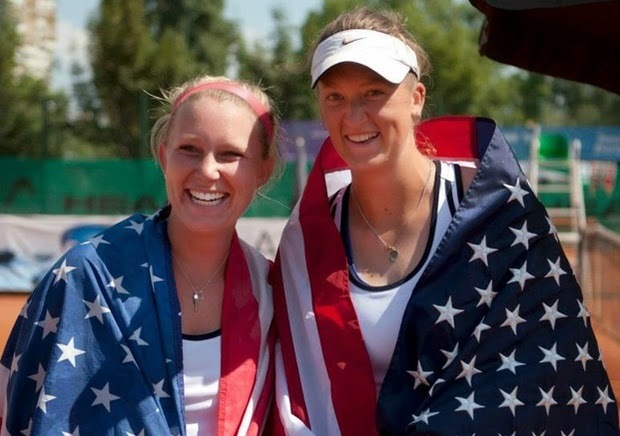 In July 2013, Emily Hangstefer and her doubles partner Laura Chapman were fighting for a gold medal on red clay courts in Sofia, Bulgaria. Just three years earlier, Hangstefer, a former collegiate player who has congenital sensorineural hearing loss, didn’t even know that deaf tennis tournaments existed. Now she was about to make history at the Deaflympics. The duo, coached by Emily’s sister Katie, had seen their 4–1 lead against a team from Chinese Taipei evaporate into a 4–4 tie. Frustrated but staying positive, Chapman and Hangstefer closed out the last two games of the set and won the match. “The two points I remember are the very first point, which I was able to poach and smash the ball over the fence, and match point,” says Hangstefer. With that, Chapman and Hangstefer won the first Deaflympics medal for the U.S. in 16 years, beating the top three seeds along the way. She also won a silver medal in mixed doubles with her brother Daniel. “To hear the crowds chant, ‘U-S-A’ and realize they were cheering for Emily and Daniel brought on chills,” says Katie. Coming off her Deaflympics medals, Hangstefer was named the USA Deaf Sports Federation’s Sportswoman of the Year, the first tennis player to ever win the award. “I hope I can lead by example and bring inspiration to those who struggle with things such as being hard of hearing or other disabilities,” she says. Hangstefer is the youngest of six siblings who grew up in a tennis-playing family. Emily and her brothers Jim and Daniel were each born with hearing loss. Emily has a 58-decibel hearing loss in both ears, which is about a 50 percent loss. Hearing aids help her understand 80 to 90 percent of what people say when she can look at them and read their lips. The fact that one’s aural sense plays a big role in a player’s tennis game is hardly lost on Hangstefer. “Hearing is definitely an important part of tennis for most people,” she says. “I’ve never played without my hearing aids until last year. After college, Hangstefer stepped back from the sport, but Katie got her back into the game. From there Emily took charge. “She has always had a lot of talent,” says Katie, “but it seemed like she had other people around her telling her what to do. Says Emily, “I want to continue playing deaf tennis. It is so much fun because it is a different aspect of the game. “Just because I can’t hear doesn’t mean I can’t live or play tennis or do things hearing people can do,” she continues.